8 in long. She has a beam of 49 ft 6 in and a depth of 29 ft 11 in. She was built in 1910. MODERN MOTOR LINER launched in May 1930 for the Nippon Yusen Kaisha’s London-Japan services. The Terukuni Maru is a vessel of 11,930 tons gross, with a length of 507 feet, a beam of 64 feet and a depth of 37 feet. She was built in Japan and has a sped of about 17 knots. 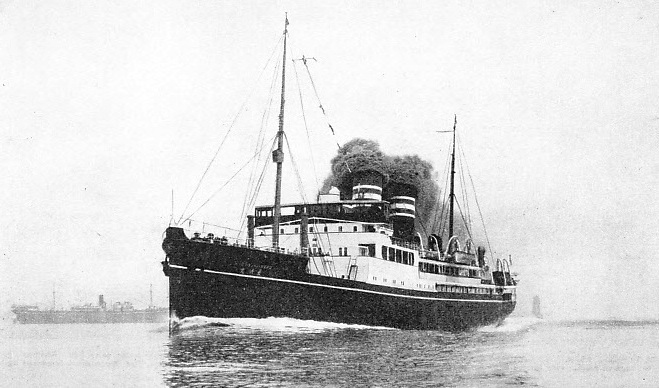 AN EARLY JAPANESE LINER built in 1908 for the Toyo Kisen Kaisha. The Tenyo Maru had a gross tonnage of 13,469. She was 558 feet long, with a beam of 61 ft 10 in and a depth of 35 ft 6 in. Dating in its modem form only from the ‘sixties of last century, the Japanese Mercantile Marine may reasonably claim to be the newest in the world. The tonnage of its powered ships, originally all steam-driven but now largely motor-driven, has increased at an amazing rate. In 1869, the first year of a complete return, the total tonnage was 18,000, ten years later it was 63,000 and in another ten years it had risen to 197,000. In 1898 it was 648,000; in 1908, 1,150,000; in 1918, 2,325,266 and in 1928, 4,139,815. Such growth would have been fatal to prosperity had it not been carefully watched. By the seventeenth century the Japanese were already receptive to European ideas. The famous Will Adams (c. 1575-1620), a Kentish shipwright, born at Gillingham (Kent) and the first Englishman to settle in Japan, received every encouragement to teach the Japanese to build ships on European lines and he found them apt pupils, But not all the Europeans who settled in Japan were as loyal as Adams to the country and its ideas. Intrigues forced the rulers of Japan into their policy of isolation, which lasted for two centuries. Isolation was so complete that ships had to be built with wide open sterns so that they were almost bound to founder if their people disobeyed commands and attempted to take them overseas. In the ‘fifties the policy of isolation was violently broken by the arrival of the foreigners, first the Americans and then the other nations one after the other. The Japanese immediately realized that their open-sterned native craft could not stand up against the steam men-of-war of the foreigners, although they attempted to do so gallantly enough on more than one occasion. The daimio, or local princes, saw that they must possess modern steamers if they were to retain their power. During the Crimean War (1854- 56) a Russian sailing man-of-war was wrecked on the Japanese coast by a tidal wave that followed an earthquake. Her crew were offered every kindness and Japanese artisans helped them build a new ship to take them back to Russian territory. This started an industry for building sailing ships. Soon afterwards, steamers were acquired from Europe and America. The first buyers of steamships in Japan were the daimio, but it proved impossible to combine the dignity of a prince with the position of a business man, who was of little repute in Japan. The first steamship service was inaugurated in 1870, but the princes and the central Government soon began to appreciate the necessity of handing the ships over to private enterprise. Thus Japanese shipping began with the initial advantage of having its tonnage provided by the authorities and it was soon to benefit by the country’s need of tonnage for its various wars. The wars started with the expedition to Formosa in 1875. Then came the war with China in 1894-95 with Russia in 1904-5, and the war of 1914-18. For naval and transport purposes in these wars the Japanese Government found it necessary to buy a large number of merchant ships abroad. They bought 96,000 tons in the year 1894 alone. Although the whole Merchant Shipping industry was held up during the periods of hostility, immediately afterwards it received the majority of the ships thus acquired. The wars also short-circuited the normal slow technical progress of a Power that was none too rich, and periodically advanced the standards of Japanese shipping by big leaps. Express Services between Japan and China are maintained by the Nippon Yusen Kaisha. The Nagasaki Maru, a vessel of 5,268 tons gross, is employed on this route. She was built in 1922 by Denny Brothers at Dumbarton. She has a length of 395 feet, a beam of 54 ft 3 in and a depth of 29 feet. Four steam turbines drive her twin screws through single-reduction gearing. When a modern shipping industry grows up in this abnormal fashion it is only natural that its character should be abnormal. Under the Japanese flag the distribution of ownership is striking. There are a few big ship-owning companies, among the biggest of their kind in the world, and there are innumerable small ones; but there are few companies of intermediate size. The two most famous of the biff concerns are known all over the world, the Osaka Shosen Kaisha and the Nippon Yusen Kaisha The Osaka Shosen Kaisha was intended to look after the minor services from Osaka, and when it was formed there were nearly a hundred owners in the port. Most of them owned only one primitive little steamer engaged in services round the coast and across the Inland Sea. The Nippon Yuseu Kaisha was formed by the union of the Mitsu Bishi Company, one of the first big private enterprises in Japan, with other concerns that had been started or encouraged by the State. Nowadays the Osaka Shosen Kaisha is interested mainly in big cargo liners that have passenger accommodation. The Nippon Yuseu Kaisha maintains numerous passenger services in luxury liners. There are still an enormous number of small ship-owning companies, although there is a distinct tendency for them to group into bigger concerns. Some of these firms employ tramp ships sailing all over the world, but Japan’s own domestic trade and the service across to the mainland of Asia absorb a large number of the smaller steam and diesel vessels. Strenuous efforts have recently been made to improve the quality of the tonnage of these services and to reduce the large number of ships that formerly came to grief every year. Remarkable as has been the ability shown by Japanese shipowners, it would have been physically impossible for them to have attained their present position in such a short time had it not been for the fact that the Government, early recognizing that Japan can expand and even exist only by sea power, has given every form of State assistance for many years past. The population has been expanding with extraordinary rapidity and large quantities of foodstuffs, formerly rice but now largely wheat, have to be imported, in addition to the raw materials for the country’s manufactures. So the Japanese regard their merchant fleet as being as important to the country as the Navy, and are willing to spend money on it. State aid in Japan began with the transfer of Government tonnage to the new companies on advantageous terms, often with a present of capital to run them. When the Nippon Yusen Kaisha was formed in 1885 the Government guaranteed its shareholders eight per cent on their money for fifteen years, and the promoters had no difficulty in raising the necessary capital. The Osaka Shosen Kaisha was paid generously for the carriage of mails, passengers and cargo among the various Japanese islands. This business was extremely important when road communications were so bad and railways were non-existent. Later the Osaka Shosen Kaisha drew a regular subsidy. When trouble with China arose a large numbers of foreign ships had to be chartered and bought. They were sold to the shipping companies as soon as the war was over. A typical Japanese cargo vessel of 1921, the Wales Maru was built at Kobe by the Kawasaki Dockyard Company Ltd. She has a gross tonnage of 6,586. Her length between perpendiculars is 405 feet, her beam 53 feet and her depth 37 feet. The Wales Maru is owned by the Kawasaki Kisen Kaisha and is registered at Kobe. The war with China not only gave the Japanese confidence in themselves, but it also made the whole country, including even the illiterate coolies, turn its thoughts towards the sea. It gave the Government the opportunity, in 1896, of launching a big scheme of shipping subsidies modelled on the French and Italian schemes. It aimed at getting the Merchant Service more ships of reasonable size and speed. Bounties, therefore, were given of so much per gross ton for every thousand miles steamed by ships of at least 1,000 tons gross, with a speed of 10 knots or more. The rate of the subsidy increased steadily with the size and speed of the vessels concerned. Foreign-built ships were at first allowed to draw this subsidy if they were fewer than five years old and owned exclusively by Japanese subjects. Before long, however, the shipbuilding industry demanded just as much encouragement as the shipping, so the benefits given to foreign-built ships were reduced to half those payable to ships built in Japanese yards. The effect of this subsidy law was immediate. Even for the local services, owners aimed at being above the 1,000 tons, 10-knots standard. With better facilities came better trade. A few months before, the Japanese flag had been seen on a regular overseas service for the first time – the Nippon Yusen Kaisha’s service from Kobe to Manila in the Philippine Islands. With this encourage-ment, they began to make large plans. The Nippon Yusen Kaisha extended its service to Europe and built for this purpose twelve twin-screw 6,000 tons steamers, by far the biggest to which the Japanese had ever aspired. Ten of these ships were built in British yards but the remaining two hailed from Japan, and the world was astounded that Japan could turn out such ships. The Osaka Shosen Kaisha also extended its services, although not so dramatically as its great rival; and the Toyo Kisen Kaisha, now amalgamated with the Nippon Yusen Kaisha, was established to start a service between Japan and California. Never had a shipping nation been known to rise so rapidly, but the Japanese made a careful study of sea power and its meaning and acted with great foresight. The running of ships was only one side of the question. The Navy had to be increased for their protection. For this purpose the shipbuilding industry was encouraged to expand alongside the shipping. Shipbuilders were handicapped by the lack of shipbuilding steel in the country, and the cost of importing it was an offset against the advantages of cheap but excellent labour. For many years the Japanese Navy was content to get its ships from foreign yards, principally from Great Britain, but some from America, France and Germany, while the shipbuilding industry was gaining experience with merchantmen. Then men-of-war were built in Japanese shipyards, and in an astonishingly short time they were able to turn out warships that were among the finest in the world. The shipbuilding industry was encouraged as much as shipping by the original subsidy laws of 1896 and by the amendments in 1899 and 1909. At the same time the authorities insisted on new measures of supervision until they had almost as autocratic a control of the Merchant Service as of the Navy. The spirit of Japan is different from that of the democratic nations of the West, and there appeared to be no objection to this Government control. 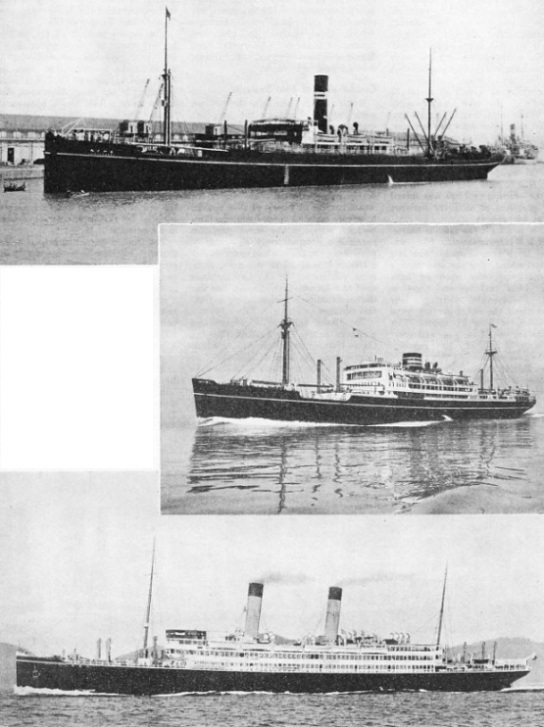 The shipowners were willing to fall into their place in the jigsaw of national services. Even so, the whole of the Japanese shipping and shipbuilding services were not founded on these State aids alone. Numbers of firms have shown the greatest individuality in working out their own salvation with considerable success In addition to the ships built in Japanese yards with State assistance, many were bought from European owners, some of them long after they had passed their first youth. They were ran on the tramping services for some years before they went to the scrappers, and their material was carefully worked up into new ship plates. On the Orient and California service the Nippon Yusen Kaisha employ the Chichibu Maru, a motor passenger liner of 17,498 tons gross. She was built In 1930 at Yokohama. She has length of 560 feet, a beam of 74 feet and a depth of 42 ft 6 in. The Chichibu Maru has a cruiser stern, and below her main strength deck are three others, with a fourth deck in Nos. 1, 2 and 3 Holds. The Japanese are extraordinarily clever at patching up ships, so that many of these foreign-built ships, which were reckoned to have had a full life under their original flags, served for many years more under the “Rising Sun”. Their overhead expenses were small, and with low running costs they contrived to do well, but the authorities considered that so many old units, with an inevitably high proportion of losses were bad for national prestige. For many years their efforts at improvement were limited in scope, but the war of 1914-18 gave them their opportunity and they brought pressure to bear on the individual owners so that now the Japanese Merchant Service is among the most up-to-date in the world. Although Japan possesses a number of “old crocks”, they are in great minority, and are inconspicuous beside the fine modern Japanese vessels. Although Japan was an active party in the war of 1914-18, she was largely concerned with the supplying of stores. This caused an immense boom in shipping. There was work at a high price for every vessel that could be commissioned. The shipbuilding industry also benefited greatly from the boom. 6-in in height were uncomfortable for Scandinavian-Americans over six feet high. The condition of the Japanese Merchant Service now differs greatly from that before 1914. There are still a number of tramps, but the proportion is far smaller than before 1914 and the majority of the cargo ships run on regular berth. The standard of these vessels is much higher than before and would be a credit to any flag. The control that the State maintains over the personnel – every Japanese seaman is a Naval Reservist – brings and keeps the men up to the same standard as the material. Another change in Japanese shipping, nearly as striking as the changeover from tramp to liner, has been the way in which the diesel engine has been adopted. Although Japanese coal was not the best in the world, it was suitable for ships’ bunkers, and was so cheap that it gave their steamers a considerable advantage. Yet nearly all the new merchant ships that have been built, both large and small, in Japan have been diesel-driven and the Japanese manufacture of diesel engines of European design has been admirable. They have to import every ton of oil that is used, but their motor ships are undoubtedly most successfully and economically run. Japan was the first big maritime Power to be able to declare that it had not a single ship laid up for lack of employment. All the large shipowning companies and many of the smaller ones have modern fleets that can be run with remarkable economy and efficiency. The Japanese Navy has a large supply of ships available for auxiliary purposes whenever they are wanted. Some of the fastest motor cargo liners in the world are under the Japanese flag, and are specially designed for the carriage of silk across the Pacific. Japanese motor passenger liners are so cleverly designed with the usual Japanese economy in space that they compare favourably with many much larger ships under foreign flags. For economic reasons, other countries cannot see their way to building tankers with a higher speed than 13 knots, but the Japanese tanker owners, with the help of the Navy, have built them with trial speeds of up to 20 knots. 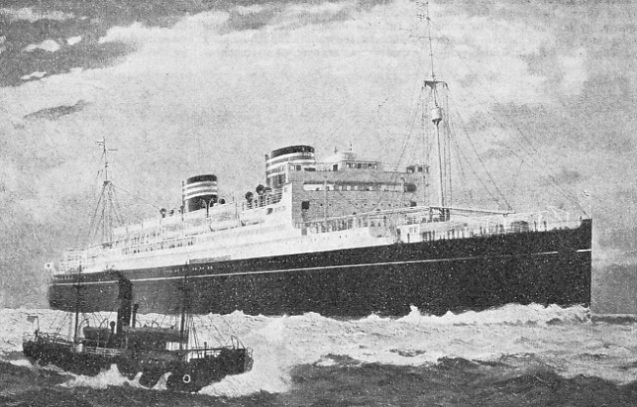 The imposing appearance of the modern Japanese liners is shown in this illustration of the Asama Maru. A Nippon Yusen Kaisha liner of 16,975 tons gross, she is 560 feet long, with a beam of 72 feet and a depth of 42 ft 6 in. She was built in 1929 and is propelled by four screws. Her sister ship, the Tatsuta Maru, is of similar appearance; the Chicubu Maru, while practically a sister ship, looks very different. You can read more on “The Hyogo Maru”, “The Imperial Japanese Navy” and “The Kurenai Maru” on this website.